Irrefutable source: Visit Catholic Bishops´ Conference of the Philippines Online and read Most Rev. 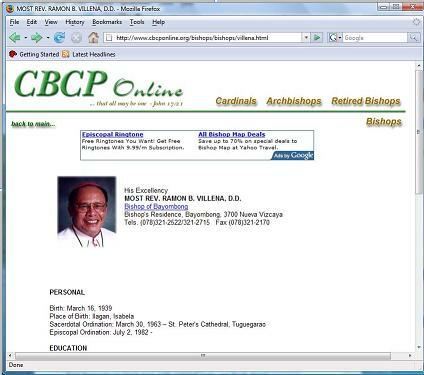 Ramon B. Villena, D.D’s profile, Or you can also click the screen shot below: copied and pasted image from the CBCP online website as of March 28, 2008. For more information, you can type, “bishop villena +cbcp” (without the quotation) to your favorite search engine. If you happened to use Google by typing http://www.google.com, you will get the Google results of about 792 for bishop villena +cbcp or similar. Note: The letter is published with permission from the author – Mr. Perry a Fil-Am Yahoo Group member.